What coffee connoisseurs love about their latte macchiato is the thick, creamy milk froth on top of their drink. However, in many processes, frothing appears as an undesirable side effect that can lead to problems if it influences the level measurement. Ideally, the sensor would ignore the foaming, as it does with the level switch LFFS for point measurement, sensing using electromagnetic waves, which only reacts after the actual liquid level has been detected. 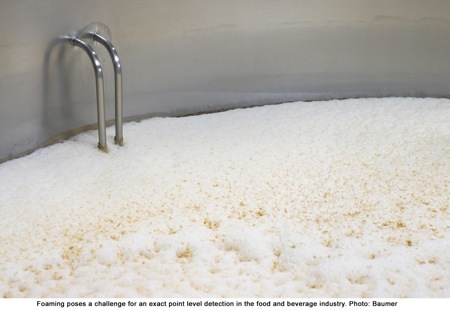 Although seen in many fields of daily life – just think of a hot bubbly bath or the tempting froth on fresh beer – foaming poses a challenge in process measurement, for example in the brewing, fruit juice or milk industries. 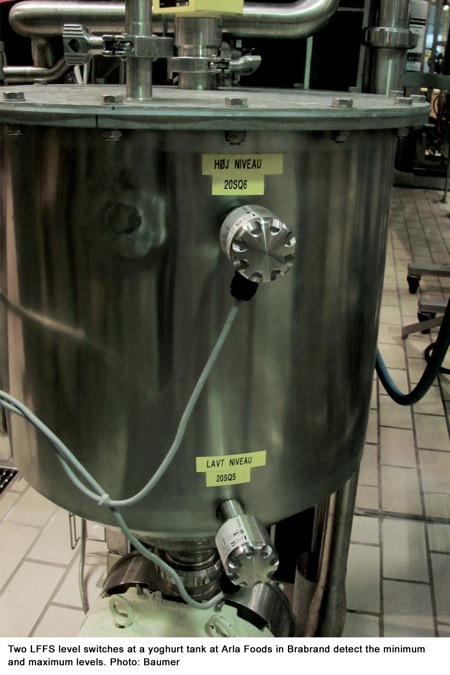 Point level detection in tanks is one of the most common applications in the process industry, making use of a number of point level switches based on various technologies. The technologies’ suitability depends on the application and external standards or approvals requirements. High hygienic standards have to be met especially in the pharmaceutical and food and beverage industries, where approvals like 3A, EHEDG and FDA certifying the devices’ hygienic capability regarding their design, construction and material, are essential.In many processes in these industries, the foam forming on the surface of the rising or falling liquid level would be detected by an ordinary level switch, which would operate even though actual liquid level had not yet been reached. Erroneous level measurements caused by false minimum or maximum level indications lead to process downtime or production quality problems. 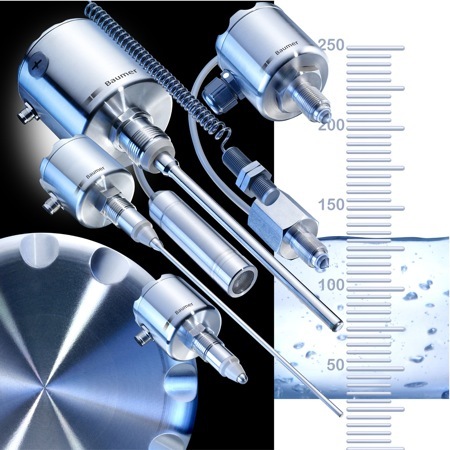 For applications like these, Baumer offers the LFFS designed especially for the use in hygienic processes. With its factory supplied configuration the level switch will detect the difference between foam and any aqueous liquid. Additionally, by using the configuration tool FlexProgrammer 9701, the adjustment of switching sensitivity, response time and output options, allow precise measurement parameters to be set. 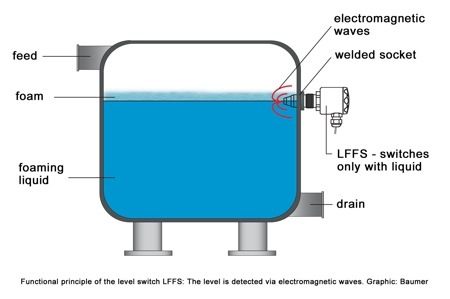 Prevention of erroneous level measurements using the LFFS allows productivity to be increased, quality improved and financial efficiencies realised. A high-frequency signal sweep is radiated from the sensor tip into the tank. The media will act as a virtual capacitor, which together with a coil in the sensor head, forms a circuit creating the switch point signal. This virtual capacity will depend of the medium’s dielectric value and is well defined for most media. The switching function – whether open or closed – can be realised by changing the type of connection or by use of the FlexProgrammer 9701. The output type can be chosen as PNP, NPN or digital out by the programming unit. A damping of the output signal can be activated in case of a fluctuating media level, e.g. during the tank filling. The advantage of the LFFS technology lies in the fact that only the very small conical measuring tip needs contact into the media. With other technologies the sensor requires a bigger surface contact into the media which viscous or adhesive media can easily adhere to causing switching errors. Whereas with the LFFS the small wetted surface of the sensor is highly resistant to media adhesion. 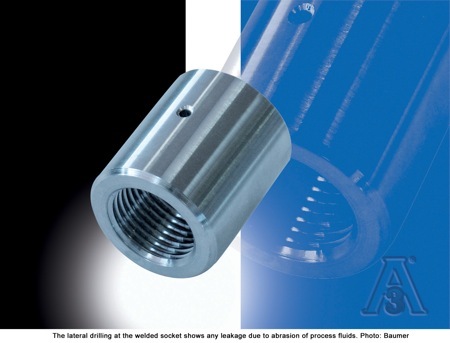 A special 3A welded socket ensures the hygiene-approved mounting into the process tank, and further offers the advantage of a drilled port to show leakage past the measuring tip that would consequently cause a dead-space contamination problem. The device’s 3A approval is only valid in conjunction with a 3A approved tank mounting connection – in this case a welded socket. All components in contact with the media to be measured are made of acid-proof high-quality steel or PEEK thermoplastics and fulfil the FDA, 3A and EHEDG regulations. The device is available with various 3A-approved process connections. The LFFS measures the limit value of fluids (e.g. water, beer, milk); viscous and even dry substances (e.g. ashes, flour or grain). Already factory preset and without any further adjustment, the LFFS detects the level of aqueous fluids, liquids, viscous fluids and even dry media. For particularly difficult media like adhesive substances, the teach-in function enables a manual adjustment of the level switching point to be programmed. A 360’ visible high intensity blue LED on top of the LFFS indicates when the switch point is reached, with the switching status user programmable to normally open (NO) or normally closed (NC). The indication can be seen easily even if the sensor is mounted on top of a tank. Operation is unaffected by vibration or turbulence in the media. Since the mounting position does not affect its performance, the sensor can be installed sideways or at the bottom of a pipe as used for pump dry-run protection. For use in closed tanks the device withstands a pressure of up to 40 bar. Since the level switch does not contain any moveable parts and its electronic unit is completely integrated, it is maintenance-free offering a high reliability and low cost of ownership. 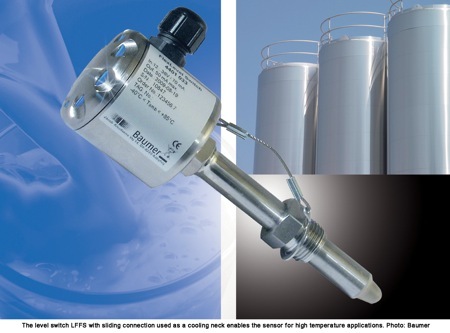 In the standard version, the level switch is designed for permanent process temperatures from -40 °C up to +85 °C. However, it is suitable for the use in CIP and SIP facilities with short-term temperatures of up to 140 °C for a maximum of one hour. 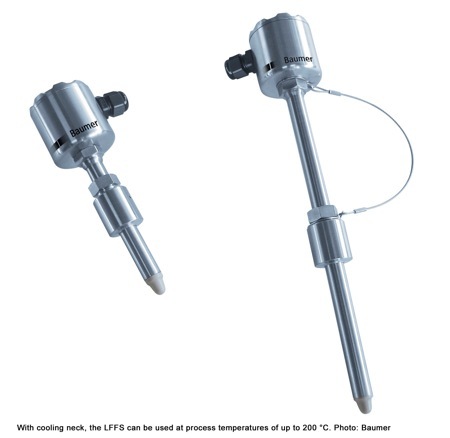 With an optional 100 mm or 250 mm cooling neck, the LFFS can then be used continuously at process temperatures of up to 200 °C. The cooling necks are designed with sliding connections and can therefore serve as an extension, e.g. if the sensor tip has to reach deeper into the tank, or if the media has to be reached through a tank insulation. 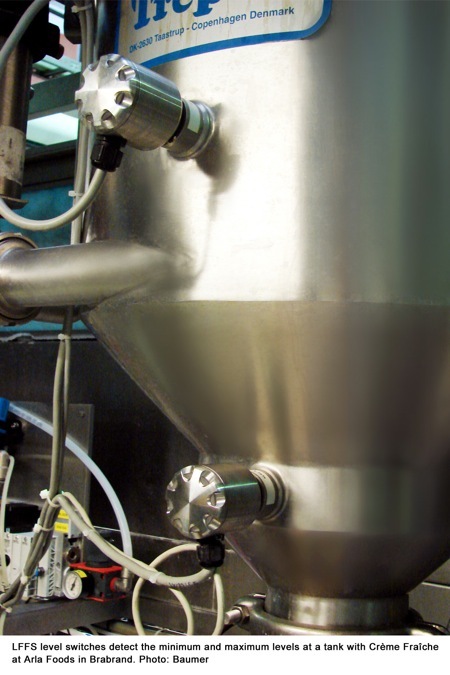 The hygienic LFFS models are used primarily in the food and beverage industry. At Denmark’s largest yoghurt dairy, in Brabrand, Arla Foods uses the LFFS in the balance tanks of different filling machines for high and low level detection. In one case the medium is yoghurt, in the other it is Crème Fraîche, a heavy cream with 10 to 38 % fat content. Both media are very viscous and adhere to the measuring devices. Arla Foods has removed vibrating tuning fork type switches because their function and switching was affected when the media adhered to the forks which led to incorrect measurements. These were replaced with LFFS that now detect the level accurately and reliably. 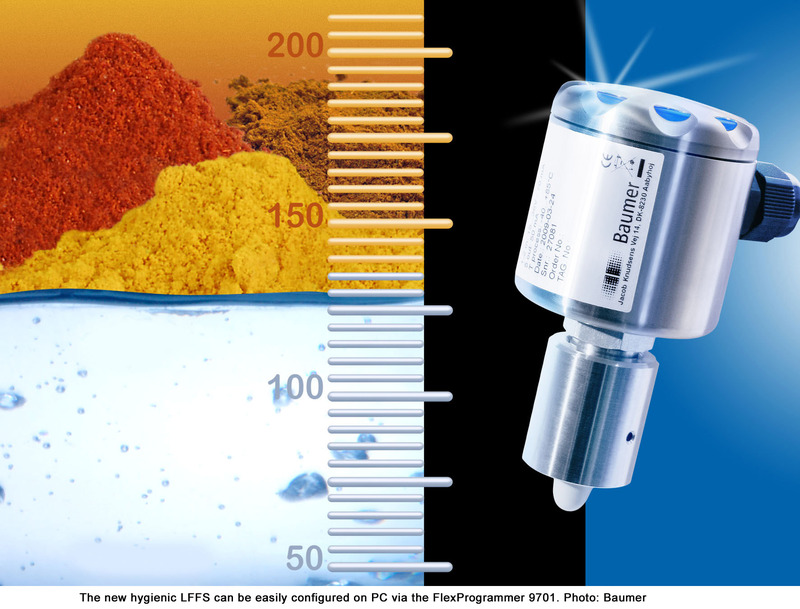 In addition to the LFFS, Baumer offers their customers optimal solutions and technologies for most level measurement applications, utilising a wide range of continuous and point measuring level devices based on various technologies, including differential pressure; potentiometric; capacitive; ultrasonic and optical. These are variously available for contact or non-contact as well as side-view mounting. This entry was posted on Thursday, August 12th, 2010 at 1:56 pm and is filed under Applications, Automation, Food. You can follow any responses to this entry through the RSS 2.0 feed. You can leave a response, or trackback from your own site. Thanks, Now I got more information about Level detection of foaming media. I want to know, how to check ensure electromagnetic wave part with welded socket no leak ?